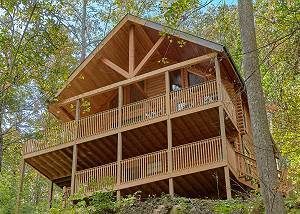 Tranquility Den is the cabin you have been looking for your memorable experience in the Smoky Mountains with family or friends, you'll need to consider... VIEW NOW. Click Here for Gatlinburg Golf Courses information. Come Ride the only Computerized Go Cart in Town Mar-Nov & some weekends in winter. The #1 Christian dinner show in the Smoky Mountains! Ride 7,000 acres of mountain trails, Cross fresh mountain streams, ride to the falls of the bluff or top of the bluff for spectacular, scenic views Open Year Round - weather permitting. Country Tonite Theatre 1-800-792-4308 or 865-453-2003, Located at 129 Showplace Blvd. Voted "Best Show in the Smokies" and "Best Live Country Show in America" year after year by the CMAA, Country Tonite explodes with the best vocals, dance, comedy and excitement of any show in America! It has the perfect combination of new and old country classics that provides non-stop entertainment. The #1 amusement park in the Smoky Mountains, Dollywood is home to a ton of exciting shows, shops, restaurants and roller coasters that families from all across the world are sure to love. Inspired by both the rich culture of the Smoky Mountains and the vibrant personality of country music superstar Dolly Parton, Dollywood is a ‘must see’ for everyone who visits the Smokies. World's Largest Private Collection of Elvis Memorabilia, Souvenir shop, self- Guide tour, The King's Car, Jewelry, Clothing, and Guns. DIRECTIONS: I - 40 to Exit 407, South 9 miles on the right. Nation's only indoor Skydiving Simulator at a vertical wind tunnel! Goats on the Roof 865-366-7139, Located at 1341 Wears Valley Rd. A unique Pigeon Forge attraction that the whole family will love, Goats on the Roof invites guests to come feed their goats, buy a t-shirt at their souvenir shop, go gem mining, or take a ride on their brand new alpine coaster. Hatfield & McCoy Dinner Show 865-908-7469, Located at 119 Music Road. Sit back and relax as members of both the Hatfield and McCoy families fight to settle one of the longest-standing feuds in the Smoky Mountains. Also, be sure to come hungry and the crew serves up a delicious homestyle dinner every evening. Hollywood Wax Museum 865-428-5228, Located at 106 Showplace Blvd. Meet your favorite celebrity by paying a visit to the Hollywood Wax Museum in Pigeon Forge. Here, guests are able to walk through a large display of Hollywood icons from both today and yesterday. Be sure to bring your camera! The fastest-growing entertainment complex in the Smoky Mountains, The Island in Pigeon Forge is home to a variety of shops, restaurants, rides, and more! When you are there, be sure to check out the synchronized music show with the attraction’s $2 million, Las Vegas style water fountain, or take a ride on their 200-foot, all-glass ferris wheel. A fantasy land play area for kids ages 3-12. One of the largest laser tag attractions in the Smoky Mountains, guests here will also find a black-light mini-golf course, an arcade, and an outdoor downhill go-kart track. Legacy Mountain Ziplines 865-774-3330, Located at 2820 Legacy Vista Dr.
Home to the longest zip lines in the Smoky Mountains, Legacy Mountain Ziplines is the perfect place for families and groups to go who want to experience a true outdoor adventure during their vacation. If you love rock n’ roll, then you are sure to love visiting the Live Rock n’ Roll Theater in Pigeon Forge. Home to three exciting shows, all dedicated to musical history in America, guests here will enjoy an evening filled with fun and excitement. New show for 2016! the Dolly Parton's Smoky Mountain Adventures promises to take you on a journey through Dolly Parton's amazing new dinner show with skilled lumberjacks and acrobats as well as a delicious meal! Elvis fans will love our Incredible Salute to Elvis & Friends, starring Lou Vuto, with Charlie Hodge, the sensational Memories Showband and The Three Inspirations. Show Time 8:00pm. MagiQuest is the journey of a lifetime! Here, kids are invited to tour through a series of quests and adventures that are all unlocked with on magic wand. An entertaining dinner theater that keeps guests on the edge of their seats as they try to figure out “who done it!” Guests have their choice of the Whodunnit Lucy or Moonshine Murder shows. A miniature golf adventure that takes guests through caves, ancient ruins, underneath waterfalls, and much more! New Rip Line Ride, Grand Prix Track, Pro track, SR2 Simulator, Arcade, Pool Tables, and Air Hockey. Smoky Mountain Alpine Coaster 865-365-5000, Located at 867 Wears Valley Rd. The longest downhill ride in the USA, The Smoky Mountain Alpine Coaster is a thrilling ride for guests of all ages. Visitors can either ride single or double down the 1-mile track. Terry Evanswood Presents “The Wonders of Magic” 865-868-1800, Located at 100 Music Rd. Audience members are invited to sit back and be amazed as the talented magician, Terry Evanswood, presents a thrilling sneak peak into the wonders of magic and illusion. One of the most exciting shows in the Smoky Mountains, The Smoky Mountain Opry Theater combines talented musical entertainment with a high-tech flair, including flashing lights, lasers, and performers suspended in the air. A two-story museum that pays tribute to the passengers and crew of the RMS Titanic. Built half-scale to the original ship, inside the museum guests, will find a variety of memorabilia, including clothes, pictures, books, jewelry, and more! An ancient Egypt-themed attraction designed to entertain kids with a variety of thrills and challenges. The Track family fun center has something fun for all ages. We offer a traditional go-kart track, "The Wild Woody" a three-tier wooden track, bumper boats, bumper cars, two themed mini-golf courses, two family arcades with skee-ball, bungee jumping and more! Home to the fastest go karts in Pigeon Forge that reach speeds between 35 and 45 miles per hour! Guided & Rental trips for the whole entire family. A result of a science experiment gone wrong, WonderWorks is an upside down interactive museum that is home to over 100 different hands-on exhibits. Perfect for kids of all ages, there is also a laser tag and a ropes course found here.